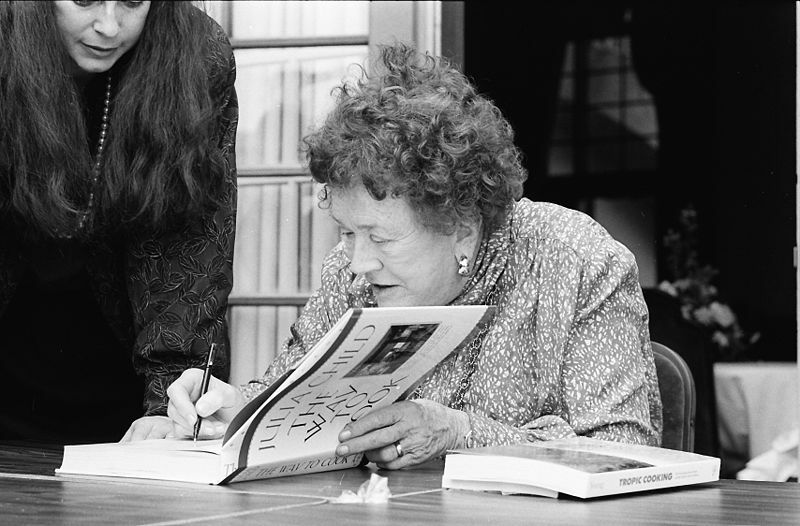 Happy 99th Birthday, Julia Child! Celebrate with some wine with dinner tonight! How can YOU take part in “Drink Wine With Dinner” Day? It’s easy! Since my husband came home with ground turkey so we could grill up some burgers, and since I LOVE zinfandel with turkey and turkey burgers (with creamed blue cheese, arugula, and heirloom tomatoes plus corn on the cob! ), I pulled a bottle of 2007 Eberle from the cellar; it’s 50%from Steinbeck and 50% Wine-Bush (and 100% Paso Robles!) At 15.9%, it’s a little big for a midweek wine; we’ll have to pace ourselves and stick to one glass–each! I just opened it to write a bit about it so it’s still a bit closed but it’s still a classic zinfandel full of brambly fruit character going on–lots of blackberry on the nose, some raspberry,a little rose petal, and it explodes with sweet fruit on the palate with a nice berry and caramel finish. With that high alcohol, you’ll want to keep this wine cool, possibly even chilling it. Plastic cork (shame!). Retail: $24 at the winery. Rosina invites everyone to take part in “Drink Wine With Dinner” Day on or around August 15th. To publicize *your* plans, simply email Rosina ~ at RosinaWilson.com@gmail.com ~ with details about your event or menu. If you include wine-friendly recipes, Rosina will credit you. Hi Gwendolyn ~ Thanks so much for your *wonderful* writeup of “Drink Wine With DInner” Day! Actually, DW2D2 has drawn so much attention that we’re streeeetching it out to fill all of August ~ “Drink Wine With DInner” *Month*! I’ll keep posting recipes and pairings on http://RosinaWilson.com. I love your blog, and when I next come down to SoCal, I hope we can meet in person. Thanks Rosina! So August will be drink wine with dinner month? Sounds good to me! I am very very pro about drinking wine with dinner! As you can probably tell from my blog–which mostly connects wine with food!! Pingback: *Great* News ~ August is Now “Drink Wine With Dinner” *Month*!! !